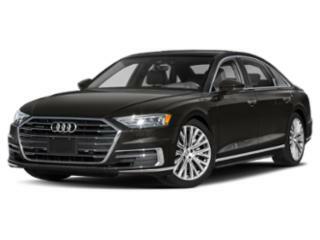 The 2019 Audi A8 is equipped with the 3.0 TFSI Quattro Tiptronic powertrain. This powertrain features a 3.0L 6-cylinder turbocharged engine producing 335 horsepower and 369 lb-ft of torque. The engine is paired to an 8-speed transmission and Quattro all-wheel drive make handling and responsiveness impressive in all weather conditions. In addition, the new A8 features a mild hybrid technology, which captures recovered energy and uses it to enhance acceleration and the adaptive suspension. The A8 also features four selectable driving modes — Dynamic, Comfort, Individual and Automatic — all of which help provide the driver with the best possible ride and handling. Additional powertrain options may be available later in the 2019 production year.